Affordable, crystal-clear audio through the home. The On-Q® lyriQ™ Audio System seamlessly integrates both aesthetically and technically with our award winning Intercoms and Speakers. Stylish, new Keypad Volume Controls have infrared sensors that allow homeowners to operate all keypads in the system from one keypad location. On-Q® designed new keypads with built-in amplifiers to provide excellent power, fidelity and control to the speakers. HIGH-QUALITY AUDIO DISTRIBUTION The Cat 5 backbone provides amplification at the volume control in each room to provide excellent power, fidelity and control to the speakers. INTEGRATION WITH OTHER ON-Q® SYSTEMS lyriQ™ easily integrates with On-Q®’s other Cat 5-based systems, such as the Intercoms and Cameras, to expand whole house technology capabilities. Keypad Volume Controls are designed to match the decorator-style wall plates of On-Q® Intercoms and Cameras, giving high-end technology a sophisticated, unified look. STYLE Keypad Volume Controls blend into the wall because they fit into standard single-gang openings and finish in decorator wall plates that match the design of typical electrical devices. 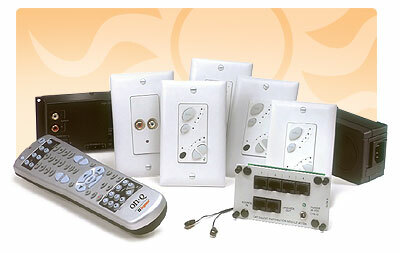 Cat 5 technology provides amplification at the volume control in each room. This means one low-cost cable reduces installation time while producing superior sound quality. Stylish modern look that nicely complements the inQuire™ Intercom System.